When you enroll in an ABC Bartending School, you're not just a number. Once you graduate you become part of a tradition in Orlando and you become a member of the ABC family of schools, nationwide. Thank you for your interest in ABC Bartending Schools with locations nationwide and our Job Placement Assistance program. The owner of ABC Bartending Schools, Tony Sylvester, opened his first Bartending School in 1977 and the rest is now history. ABC is one of the largest bartending schools in the nation with locations from coast to coast and throughout the United States. The Sylvester family has been in the Hospitality industry for three generations. Tony brings you all that experience in his school's curriculum and manual. Look at the great cities listed at the bottom of the page where Tony has opened schools. As you can see, all these cities are hospitality oriented which means lots of Restaurants, Hotels, Country Clubs, Night Clubs and Bars. Now what does that mean for ABC graduates? Opportunity! Look around at the number of liquor serving establishments in your city and the number of Bartenders, both Full and Part Time, that it takes to staff these operations. Get the picture? Bartenders are known for their ability to make a good living, have fun and meet people. Thousands of students are trained and placed every year nationwide by ABC in our professional one week, two week and three week programs that cover all the techniques used to become a professional bartender. Please call us for an appointment to discuss your future as a bartender. New classes begin every week, so call us to find out our next starting date for the class that suits your schedule best. We do have easy payment plans available… Please inquire at the school. 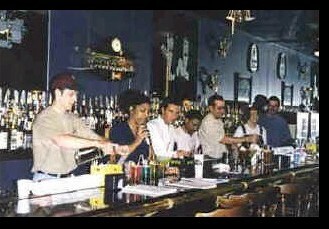 If you are looking for a bartending school in Maryland check this bartending school MD. Watch ABC Bartending Schools Television Commercial Video. Need a Player Get one Free here. Call 7 days a week for information from 9am to 10pm Nationwide.